You have to be a registered user on that site, so register yourself if you aren’t already. If you are, but have forgotten your password, the site will send it to you if you click the “forgot password” link. After entering your team name, you can just click through the “picks” screens til you get past the Superbowl winner. Curiously, if you don’t change anything, Chicago will be your Superbowl winner. So take that as an omen! Or you can make your picks immediately. After making your picks, you can change them as often as you want. Just make sure you click all the way through the Superbowl winner to finish your picks. Note that the tournament doesn’t officially start until after the 1st week of the season (so you’ll get all the first week’s games right, lucky you!). Therefore, after the first week is over, you’ll need to re-traverse your picks to finalize. This needs to be done since the results of week 1 might impact your playoff teams. So just click on the edit link in the Tournament box and run through your picks one final time. Afterwards, it will say “Ready” next to your name in the Tournament box. 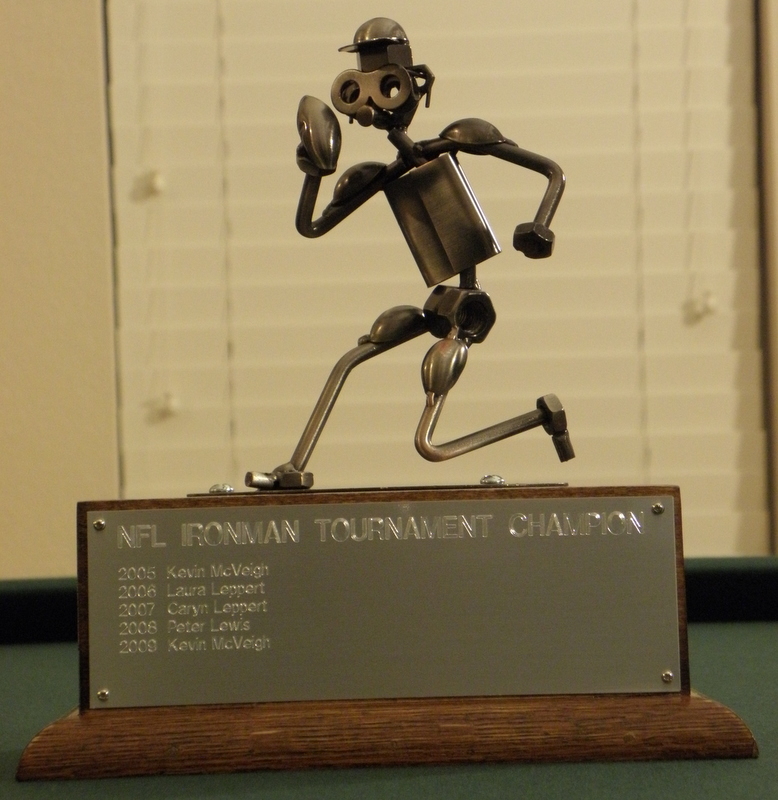 So Kevin will get to keep the Ironman trophy until the start of next year’s NFL season and the 6th annual Ironman Tournament. Stay tuned next September for the 2010 tournament, you could wind up with this, the Trophy of Champions! With New Orleans’ win last night in the Superbowl, Kevin comes from behind to win the tournament, beating Les 783 to 757! This means Kevin is taking the trophy this year which will be his second victory in the short, 5-year history of the tournament (Kevin was the winner the first year). It has all come down to the Superbowl to determine the winner of this year’s Ironman Tournament. With New Orleans’ win today, Kevin earned an additional 60 points and now has 703 points and moved from fourth place to second. He trails Les by 54 points. Kevin has New Orleans winning the Superbowl. If they do, he will get another 80 points and win the tournament! If New Orleans loses to Indianapolis in the Superbowl, Les will win. There are only three people who can score more points in the playoffs during the final two weeks: Les, Kevin, and me. Next week’s games are worth 60 points and the Super Bowl winner is worth 80 points. If Minnesota wins next week (they are playing against New Orleans), Les will win. Although I will move into third place, I can’t gain ground on Les. However, if New Orleans wins next week, and they win the Super Bowl, Kevin will win (with 783 points to Les’ 757).